Structural Integrity Engineering (SIE) has available a Federal Aviation Administration (FAA) Supplemental Type Certificate (STC #SA00364LA), Transport Canada Supplemental Type Certificate (STC #SA97-100), and German Supplemental Type Certificate (STC SA 1076 Issue 1), which supersedes the current life limit on the wing box of de Havilland Twin Otter 300 series aircraft and extends the life by as much as an additional 33,000 hours / 66,000 flights. 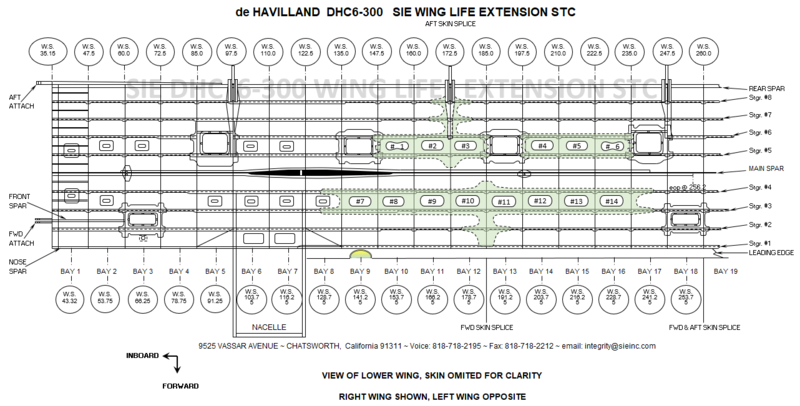 SIE’s wing life extension STC has been accepted by numerous other countries and territories. The STC validates wing box integrity by a one time initial structural rework and a subsequent recurring inspection program as outlined below. Besides being more economical than alternative modifications, SIE performs this STC modification work at your facility or at a facility of your choosing so the aircraft down time is minimized and local labor can be utilized.